UDM Downloads > Business&Games Calculator! B&G Calculator combines ease of use with a lot of powerful features for those who need them. It has a flexible interface that can be easily adjusted to your taste. It operates on various types of calculations and has all standard functions you find in a desktop calculator. Except for this, you may find unique features that turn B&G Calculator into your most devoted assistant: - form that can be easily adjusted. You can work either only with the narrow strip, or you can activate different calculator panels. - you can enter numbers and functions not only with the graphic 'keyboard' pad, but also from the PC keyboard using the calculator line of input. - working with the memory in QuData calculator is very convenient. One can use a set of cells (variables) for storage of intermediate results. You can see the current values of all memory cells on the panel Memory. - the list of calculation history allows you to return to the earlier calculated expressions. The history can be printed or saved in the HTML file. - high-capacity set of mathematical, statistical, special and financial functions allows you to carry out diversified calculations. QuData calculator also functions as the reference book on different mathematical and physical constants. You can always convert pounds into kilos, insert the distance between the Earth and the Sun into your calculations and enter your own constants easily and without any problem. - skins allow you to change calculator's appearance. For each skin you can choose font size and type. It is also possible to set the mode of random skin, and then calculator will greet you every day with new design. - in case you are tired and need a rest, you can play the most enthralling games Bubble Shooter and Gem Slider that are strongly recommended by psychologists as the best way to relax. 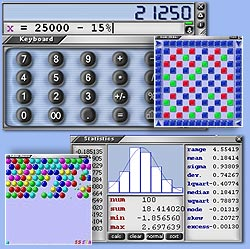 Bubble Shooter is placed in one of the calculator panels.